Mill Creek is located about 10 minutes south of Historic Downtown Charlottesville. Mill Creek sits on 57 acres and consists of Mill Creek and Mill Creek South. There are single family homes as well as duplexs. It is governed by the Mill Creek Homeowners Association. Both are off of Avon Street Extended. Mill Creek was built by Craig Builders starting in the late 1980’s. Most are cedar sided contemporary styled homes. Because of the terrain, Mill Creek has views of mountains and the UVA hospital. It is also close to Thomas Jefferson’s Monticello Home, and Carter’s Mountain apple orchard. 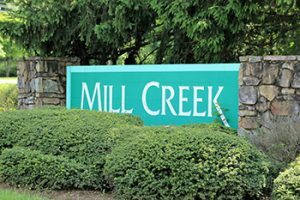 Mill Creek is a very well established neighborhood and popular with people from UVa because of it’s close proximity to the University.